Lionel Messi lit up the Sanitago Bernabeu with a hat-trick, to give Barcelona a thrilling victory over bitter rivals Real Madrid and blow the La Liga title race wide open. On Saturday Athletico Madrid surged to the top of the table on goal difference with a 2-0 win over Real Betis, Gabi and Costa finding the back of the net for Diego Simeone’s team while Barcelona’s 4-3 win put them just 1 point behind and keep them in the running for what is sure to be a stunning climax to the La Liga season. Iniesta opened the scoring for the visitors in the seventh minute, but Karim Benzema responded with a double to give Real the lead until Messi scored his first, sending the teams into the break at 2-2. Dani Alvez brought down Ronaldo in the 55th minute, the Portuguese superstar restoring Real’s lead as he converted from the spot. The match was turned on its head when Ramos saw red, bringing down Neymar in the box and then Alonso committed the same crime on Iniesta, Messi converting both to end Real’s run of 31 matches unbeaten and to keep their hopes alive of a 5th title in 6 years. 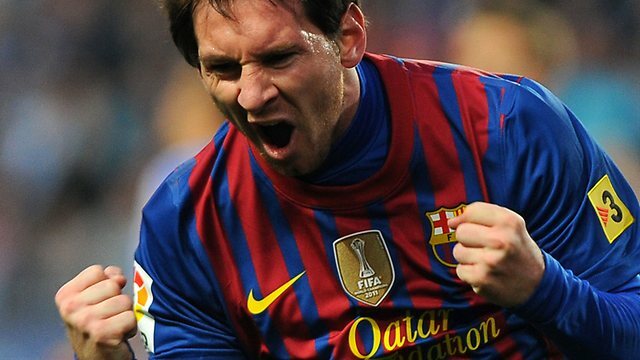 Messi’s goals saw him become the leading scorer in “El Classico” fixtures with 21.